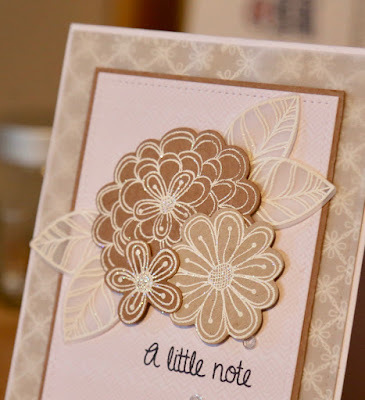 The blooms are from Pretty Posies and after embossing, I quickly covered them with white glitter so they're really sparkly in IRL. It so annoys me when you can't see the sparkly bits in a photo! I wanted to soften the background a little so I covered it with a panel of vellum to match the leaves. 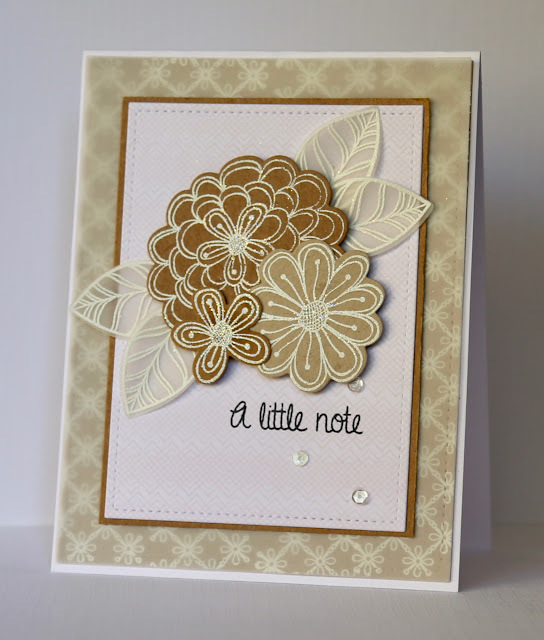 The white panel has also been stamped with Zigs and Zags (now retired) in a very pale kraft coloured ink. Actually you can barely see it in that photo either...I give up! Perfect take of our CAS-ual Fridays challenge! Good luck! Stunning! The Pretty Posies are gorgeous in kraft and white. Thanks for playing along at CAS-ual Fridays. Gorgeous card! I love the touch of vellum in it. Thanks for joining us at CASual Fridays challenge!